Contest – Win FREE BOOKS! Playground by 50 Cent – Inspired by 50 Cent’s own adolescence, Playground is a hard-hitting and inspirational story of the redemption of a bully. Advance copy, it will be available in stores in November 2011. Young adult novel BY 50 CENT! Need I say more? The Future of Us by Jay Asher and Carolyn Mackler – It’s 1996, and less than half of all American high school students have ever used the Internet. Emma just got her first computer and an American Online CD-ROM. Josh is her best friend. They power up and log on – and discover themselves on Facebook, fifteen years in the future. This book is also an advance copy and will be available in stores in November 2011. Thirteen Reasons Why by Jay Asher – Clay Jensen doesn’t want anything to do with the tapes Hannah Baker made. Hannah is dead. Her secrets should be buried with her. Then Hannah’s voice tells Clay that his name is on her tapes – and that he is, in some way, responsible for her death. 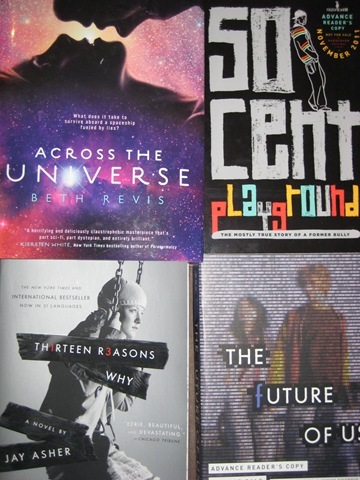 Across the Universe by Beth Revis – Amy is a cryogenically frozen passenger aboard the spaceship Godspeed. She has left her boyfriend, friends – and planet – behind to join her parents as a member of Project Ark Ship. Amy and her parents believe they will wake up on a new planet, Centauri-Earth, three hundred years in the future. But fifty years before Godspeed’s scheduled landing, cryo chamber 42 is mysteriously unplugged and Amy is violently woken from her frozen slumber. Someone tried to murder her. Now, Amy is caught inside a tiny world where nothing makes sense. Please leave a comment on this post saying which book you’re most excited to read. Contest closes Friday, October 28th at 11:59 p.m. A winner will then be selected using an online random number generator. Contest open to Canadian residents only. One entry per person.